Slowly but surely becoming one of the holy grails of SMS gaming, it's selling for ever increasing prices on eBay and it's often touted as being one of the greatest platformers on the system. 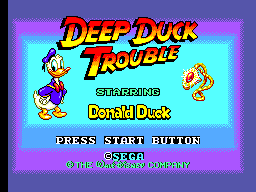 I was lucky enough to get hold of mint copy of Deep Duck Trouble a few months back, for a non too extortionate price, and hopefully my review will help you decide if it's all it's cracked up to be and worth shelling out for, or if you'd have to be quackers (booo!) to spend you hard earned pennies on it. 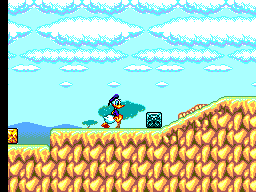 If you've ever played one of the outstanding Mickey Mouse games (Castle of Illusion or Land of Illusion - or even Legend of Illusion if your lucky enough) or even the first Donald Duck outing (Lucky Dime Caper) you'll be in instantly recognisable territory with Deep Duck Trouble (DDT from here on out). 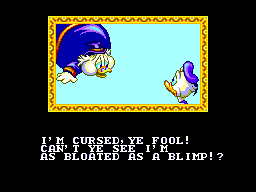 The story is suitabley weak and silly: Uncle Scrooge has been cursed and bloated up to epic, balloon like, proportions and it's up to Donald to kick the curse in the pants and deflate his money grabbing, bread munching, uncle A.S.A.P. To complete your platfrom based quest you have to collect various artifacts that 'point the way' to the answers to your problems. You'll Traverse snowy mountains to oxygen-starved hieghts before shivering your socks off in ice caverns plus tons of other locales that usually end in a chase-style boss battle where you have to dodge attacks at high speeds (sort of like when Indiana Jones gets chased by that big boulder. You can initially choose any of the four locals (split into two stages and a the final aforementioned chase section) and come across many staples of platforming jiggery-pokery, like moving platforms on tracks and jumping ever higher on jets of air. However, throughout the game you will find many interesting devices and instances of fast paced genius - e.g. at one point you'll have to jump head to head on a stampede of ostriches - I kid you not! Eat a chilly and Donald will dash off at high speed and be capable of smashing through blocks and enemies indiscriminately. There are so many devices and set pieces throughout the game that it would be hard to list them all, but suffice to say it may seem like a typical platform romp at first glance, and for all intents and purposes it is, but it has enough quirks and additions to make it more than an interesting addition to your library. This is top notch Master System fare. Donald is animated perfectly and has a good degree of character: from impatient foot stomping to little angry fits every time he gets hit by an enemy. The backdrops are equally stunning and show off exactly what the system is capable of, rendered in pastle colours, to make Donald and the rest of the foreground critters stand out, they feature many nifty little touches such as transparent ice and lumps of falling snow. The colours are used to great atmosphere and the only complaint has to be that at times all this goodness causes some extreme slow-down, however this can often save you from a missed step or an enemy projectile by giving you enough time to use your dodging skills. All in all though the game is stunning and full of nice touches that'll make you proud of your little chunky black machine. Nice cartoon tunes are done with great style and complexity. Not the greatest soundtrack but a damn good try. Perfection is the name of the game here and one you have Donald's web footed and snorkle mounted motions down you'll be on your way in no time. As good as Castle of Illusion in my opinion - yes, that good. It's not massive and not massively difficult, although some parts may have you tearing your hair out now and again, it's a classic of the genre and will hook you in for another go once you've perfected it. I've been through this game a couple of times already and will no doubt play it again somewhere down the line with the knowledge that I'll have a blast. Sure it's rare but rest assured it'll sit proudly in your collection and get played a good few times. I highly recommend DDT and although it doesn't quite pip Castle of Illusion to the post as one of my top games of all time it's certainly way, way up there. A game with great character that shines through in all aspectd as one of the finest Master System games your pennies can buy.